2400 square foot newly remodeled 4 bedroom 4 bath town home with 2 car garage and large deck on the Elkhorn golf course. Great views of the ski mountains. Easy access for all activities. Minutes to skiing, Sun Valley Lodge, and Ketchum. Steps to free bus system. Big screen TVs, internet access, and gas BBQ. Adjoining similar town home available for family or corporate retreats. Fantastic place for a vacation during any season. The availability calender is kept current. We love it here because of the tremendous views of Dollar mountain and top of Baldy. It is right on the golf course which has crosscountry skiing in the winter. It has abundant open space, provides close access to all our outdoor fun. It is right on the bike path and free bus system. And we get all the amenities of Elkhorn including usage of 2 big outdoor pools, jacuzzis and tennis courts. The townhome has been completely remodeled with a very large outdoor deck and provides alot of space for adults and kids. Dollar Mountain skiing is only 1-2 minutes away by car or bus. The big ski hill - Baldy is 10 minutes by car and a little longer by free bus service. The open space and mountain air is invigorating. Access to other Elkhorn amenities including 2 large outdoor pools, Jacuzzi, steam, sauna, and tennis courts. Very cozy spacious home to celebrate Christmas with my family. Owner was very easy to work with. Added bonus to already have a Christmas tree up for us when we arrived. Excellent accommodations with all the amenities of a luxury townhouse. My wife and I rented the Moreland townhouse last year and were very impressed with the interior decor and amenities provided to the guests. We decided to rent the townhouse again this year. This was by far one of the best relaxing vacations we have had. The view of the ninth fairway and mountains in the background was like a fine painting. We enjoyed going to Wagon Days parade of horses and horse drawn wagons. 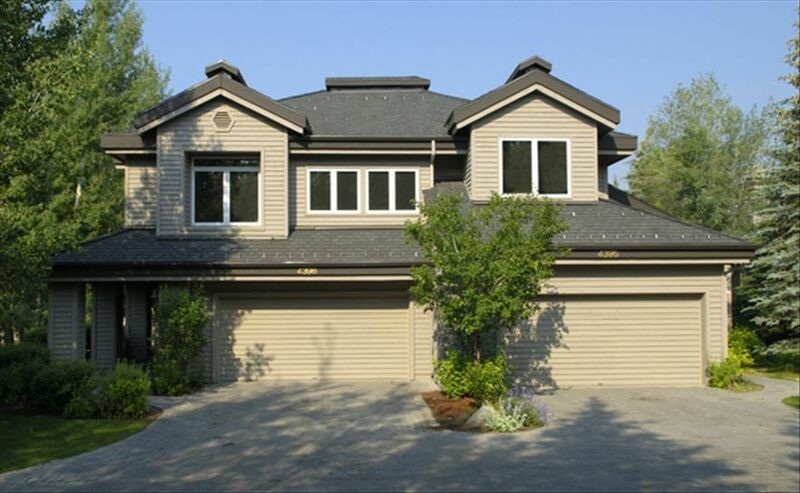 The townhouse is in close proximity to Sun Valley, Ketchum, and Hailey. The weather was perfect as compared to last years haze and smoke caused by the forest fires across the state. We will definitely consider booking future vacations at the Morelands. Beautiful condo in an amazing setting. The 4 bedroom condo was everything thing we had hope for! Great location, beautiful decor, excellent host. We had a great time —like Sun Valley a lot! I stayed at this property for two weeks with my family of four and our nanny. We have two toddlers and we brought cribs for each of them in their bedrooms. We were immediately impressed with the home. Very clean. Well decorated. Luxury feel. The views can't be beat! The kitchen is very well stocked. This is the best VRBO we have ever stayed in. Pros: Spacious. Clean. High End. Great decor. Four bedrooms plus a tv room that could be used for older kids to sleep in if need be. Great Elkhorn location. Can ride bikes down the path to the Sun Valley Lodge and easily into town. Owner very easy to work with. The bedding was AMAZING. I'm picky, so I really appreciated the soft pillows, down comforter, and quality sheets. Great places for the kids to play on the side of the home and in front. Great media room off of kitchen that would allow separate hang out space from the main family room. Well constructed. Can easily sleep upstairs and not be bothered by noise from downstairs. Cons: Very few. Master bathroom is a little out dated with small tub. No A/C, but open the windows and you will be fine. No garage opener, need to get out of car and enter code on key pad. Backyard is not fenced. There is a little bit of a drop off to the grass on the other side of the bench. My 3 year old fell off. He was fine, but it made me nervous. I'd say fine for older kids, for toddlers you will need to keep a close eye if they are on the back patio. Plenty of other green areas to play in front and on side of the rental. Overall, a wonderful experience. We would definitely rent this place again! So glad you enjoyed your stay!! We had a wonderful stay at this town home. It slept 8 adults very comfortably. The space is amazing and perfect for a group. The kitchen is fully equipped with anything you would need to make a wonderful meal. The owner was very responsive with any questions we had. The decor is beautiful and very up to date. We would definitely rent this town home again in the future. 2.5 Hours from Boise. 20 Minutes from Hailey Airport.